Creative Zii Egg = Next Gen Apple iPhone/iPod Touch? Just the other day, when we released the news of the Creative Zii Egg, we suddenly received alot of readers visiting our site and they were reading this article. After our investigation, we found the massive traffic comes from macrumors.com. Our article was picked up by these Apple fans and they are interested in the Creative Zii Egg. Well, back in May 09, when they first saw this black bezel appearing in Chinese supplier website. They thought its a new iPhone or iPod Touch in the making. As iPhone or iPod Touch currently have shiny silver finishing. So this is something new for them. Now, with the official launch of the Zii Egg, it becomes clear that the Chinese supplier are working on some kind of Zii Egg. The Zii Egg is a multi-touch iPod Touch-like device that runs Google's Android operating system. The Zii Egg although can run on Google Android but it may not necessary come pre-installed with Andriod. 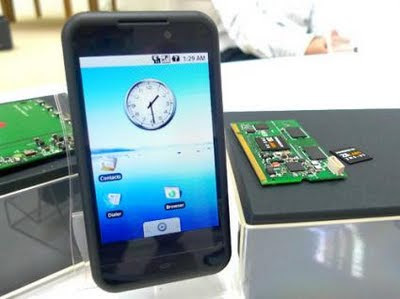 It is flexible to run on some other platforms such as the iPhone, Symbian and Windows Mobile. 1. Go back in time, when Apple paid Creative US$100 million for the ZEN patent. Many analyst think that this amount is far too low and the Creative's lawyers can sift out billions of dollar from Apple from this patent rights. So we think that Creative may have some hidden agreement (not released in the public) that they can the next OEM manufacturer for them thus creating a win-win situation for both Apple and Creative. 2. Creative has been making made-for-iPod accessories such as portable speakers and itunes or ipod compatible products ever since the US$100 million settlement. So why can't they be the OEM manufacturer and help Apple manufacture iPhone and iPod? Tell us what do you think? Get more details here! Creative Zii Egg = Next Gen Apple iPhone/iPod Touch? I'd like to think so, but Apple is to stubborn for that. However, they did fail to answer whom they partnered with in designing their in ear headphones..
Apple has it's own OS and hardware design sectors. That makes me think maybe not. Over that the EGG doesn't appear to have native MAC support (as per specs). So maybe not ? can you cover more about the apple's in ear headphones? I like this article it gives me an idea on how to chose, I also found some helpful tips about that in this Gadgets Website , Thanks a lot.